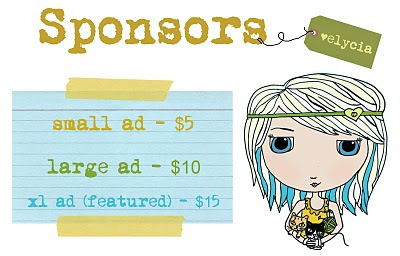 just a quick note to let you know that i am accepting sponsors for November :). my October sponsors were wonderful (check them out!) and I can't wait to introduce you to my new ones for November. thank you to everyone for their support. i really appreciate all of you who stop by, it makes me so happy. on that note...i have been wanting to have a 'you are all awesome' giveaway for a while now...so i will be posting it TOMORROW! your such a doll! thanking us for visiting! we should thankyou for sharing your sweet blog with us! I heart your blog. I featured your mustache headband on my blog :) You should pop in and check it out www.scootchover@blogspot.com/ ! I'd also love to interview you if you get a chance :) I hope you consider it! Looking forward to your giveaway. stunning blog my dear! i also love love love the color of your hair !! stunning! !